David Thompson, fur trader, explorer, surveyor, was born on the 30th of April 1770 in the parish of St John the Evangelist, Westminster (London), the son of David and Ann Thompson. By instructions of his employers and by his own initiative, he explored and surveyed more than four million square kilometres of wilderness, accomplishing the staggering feat of mapping one sixth of North America. 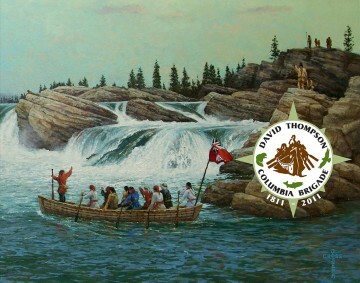 A recent National Geographic story on Thompson stated that David Thompson made Lewis and Clark look like tourists. Even Alexander Mackenzie, the renowned explorer, was quite astounded and remarked that Thompson had performed more in ten months than he expected could have been done in two years. Thompson’s great map which hung in the Great Hall at Fort William, was perhaps his greatest achievement, and was so accurate that 100 years later it remained the basis for many of the maps issued by the Canadian government and the railway companies. David Thompson’s many journals have also enabled us to witness the early fur trade and the ways of a world that has long since vanished.